Vegetarian, vegan…and now, gluten free: it’s the latest dietary trend sweeping across restaurants and grocery stores alike, to the delight of those with Celiac disease or gluten-intolerance, as well as some health experts who advocate the benefits of eliminating wheat products from any lifestyle. Brooke Hamroff, who graduated from Wash U last year, has Celiac disease and as a lover of baked goods, she was on a mission to save the gluten free dessert world from the cardboard-like dryness that characterizes its breads and cookies. While you may have seen posh gluten free cupcake stores popping up in big cities throughout the U.S., you haven’t seen the perfect gluten free brownie…until now. Enter: #NUGGETS. 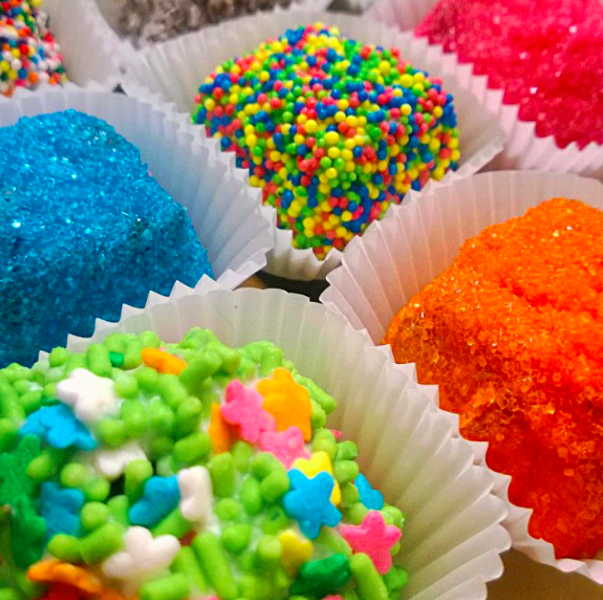 These fudgy gluten free chocolate brownie bites, decorated in colored sugar and sprinkles, are Hamroff’s signature recipe and the product behind her new company, whatthegf. Initially, Hamroff developed her brownies through trying out different combinations of chocolate chips, gluten free cookies and brownie mix in her apartment at school during her senior year. Although her friends were skeptical of her attempts at first, the sudden demand for more of these chocolate treats was an indicator of her future success in such a niche market. 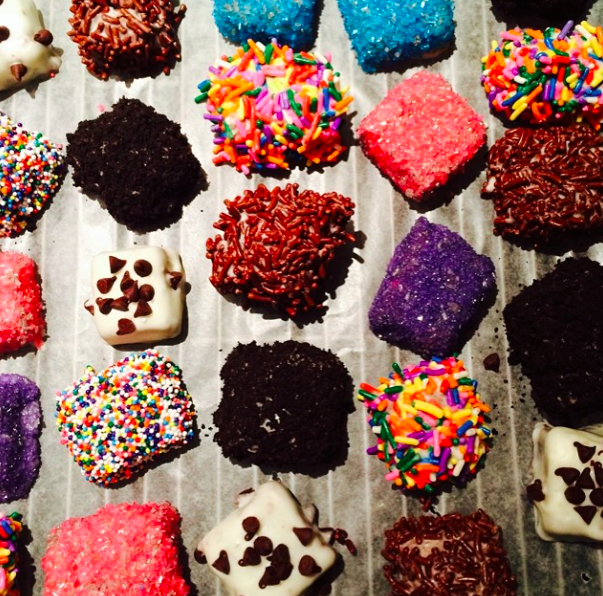 “Everyone does cake pops and cupcakes, but no one was doing brownies. No one gives them any love,” Brooke explains. Love is definitely a key ingredient in #NUGGETS. Once she returned home from graduation, Hamroff tried out over 20 recipes of her own to eliminate the brownie mix from her creation. After several months of baking, tasting and tweaking the ingredients, Hamroff was able to narrow it down to five different recipes for which she held an official taste test amongst her family members; the result is the current recipe. 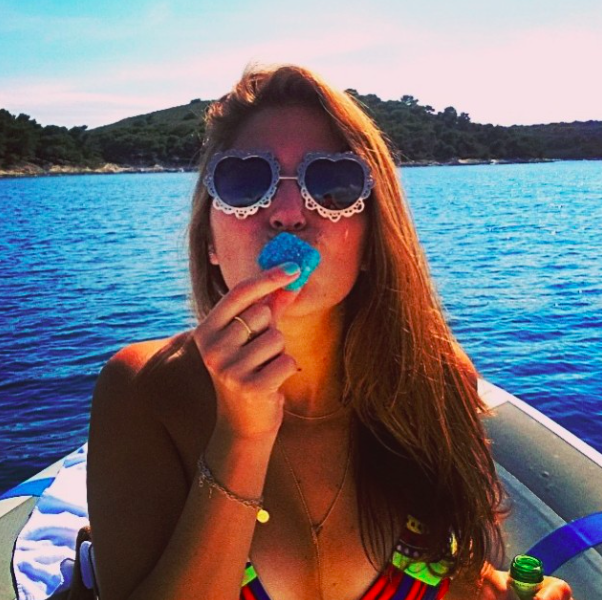 The whole idea of whatthegf started in the summer after Hamroff’s junior year of college, when she created a food Instagram called @whatthegf with her cousin that was initially comprised of cupcakes and other baked goods. Hamroff revitalized the account with gluten free brownies after a short break in posts when she went to Wash U and her cousin went to Boston University. Before the brownies, the account boasted a humble 200+ followers and since this past March alone, has expanded to include over 2,000. Hamroff hopes to capitalize on this new following. Hamroff currently lives in New York City and works full-time in PR, baking brownies and working on whatthegf at night and on the weekends, although she hopes that, in a couple years, whatthegf will grow enough that she can bake full-time. While #NUGGETS may be especially exciting for those with Celiac or gluten-intolerance, simply due to the scarcity of desserts that fit into a gluten free diet, one of Hamroff’s goals in making #NUGGETS was to produce a brownie that even those without such dietary limitations could enjoy. In order to get your own batch of #NUGGETS, you can email Brooke Hamroff directly at whattheglutenfree@gmail.com. Looking for more gluten free?